Our Kidd Creek Rifle Range is located approximately 21km east of Creston, one kilometre up Kidd Creek Forest Road from Highway 3. It has covered shooting areas for pistol shooting, big bore shooting and .22 silhouette. Our big bore range has target boards at 25, 50, 100, 200 and 300 yards. Please follow all range safety rules. 1. The combo is on your membership card which you must have at the range. Do not share! 2. Set the number on the bottom of the lock. 3. Push, then pull to open. 4. Scramble the numbers & lock yourself in. 5. Enjoy safely; follow basic range commands. This range will remain closed until there is a further official range inspection. This venue may be used for archery only; no firearms. Our trap area has both a field trap members can use at any time with their own clays and a trap house which is used for trap evenings every two weeks during the season. There is a small charge for each round of 25. Check the range schedule for dates. *The range is intended for the use of members only. You must carry and be prepared to produce your Club membership card. To bring a guest you must purchase a $5.00 guest pass at one of outlets (see “join”) and sign them in at the range for liability purposes. Trespassers should be reported and will be prosecuted. **The range is occasionally closed for special events and use by other agencies who pay for this privilege. Pick up a range schedule when you buy your membership and check the events tab on this web-site. ***To report a problem or ask a question call our range chairman, Shawn Carson at 428-2035. ****The range has been financed, built and maintained by volunteers. Please keep it clean. Come out on range clean-up day every April to do your part. Each May we hold an Open House called Family Heritage Day to celebrate the role shooting and hunting has in our community. 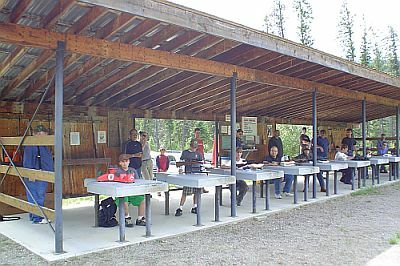 The public is encouraged to come and try pistol, rifle, shotgun shooting and archery. Firearms and ammunition are provided.